Materials: Wood, iron, steel, copper, gold. 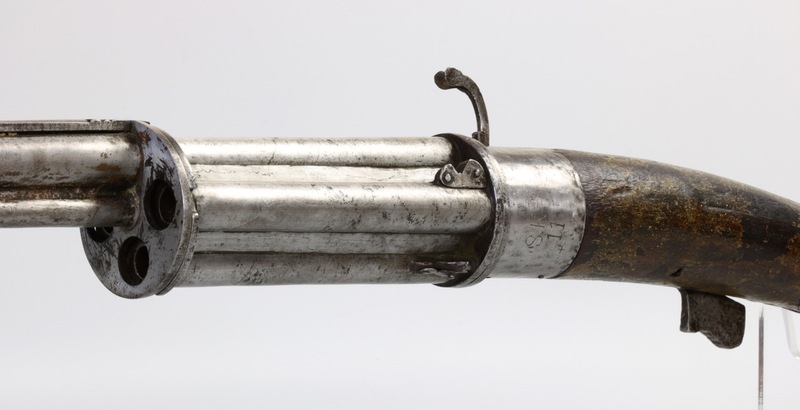 A very rare example of an Indian matchlock with revolving mechanism allowing it to shoot four charges in succession. 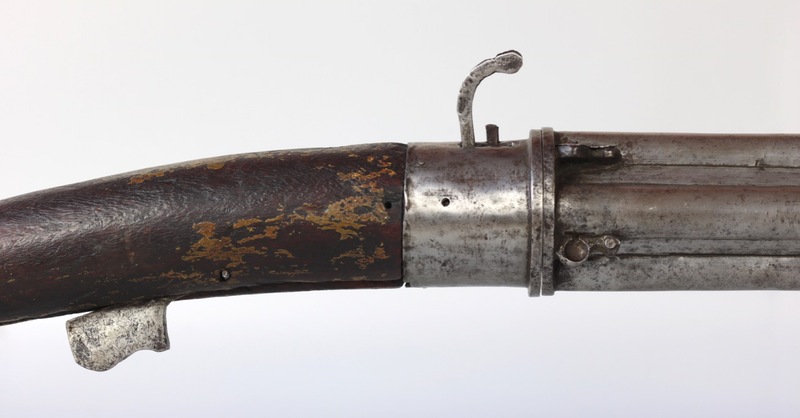 It works like a conventional matchlock musket, but instead of reloading after every shot it carries a cylinder with four separate barrels that can be pre-loaded. After every shot, the next chamber is aligned with the main barrel by twisting it manually. 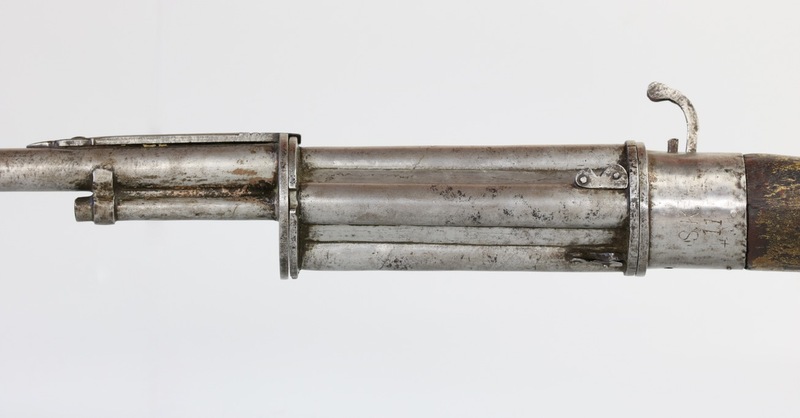 A leaf spring on top of the barrel locks it into place. The priming pan cover is opened and it is ready for firing. 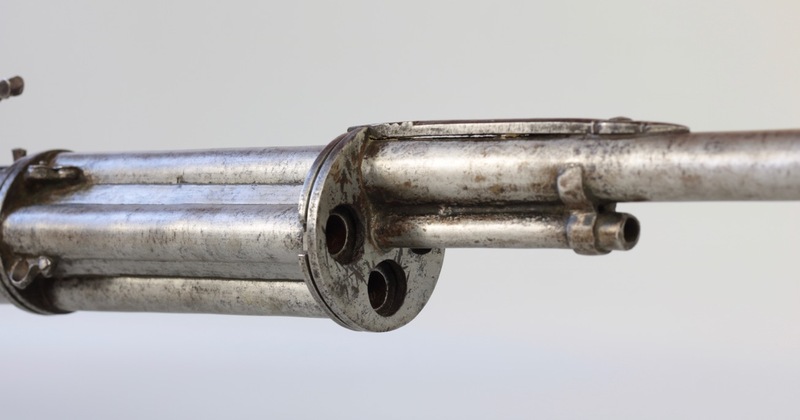 Colt didn't give up and continued to improve his designs, which lead him to produce the first mass produced revolver, a monopoly he held until 1857.
" 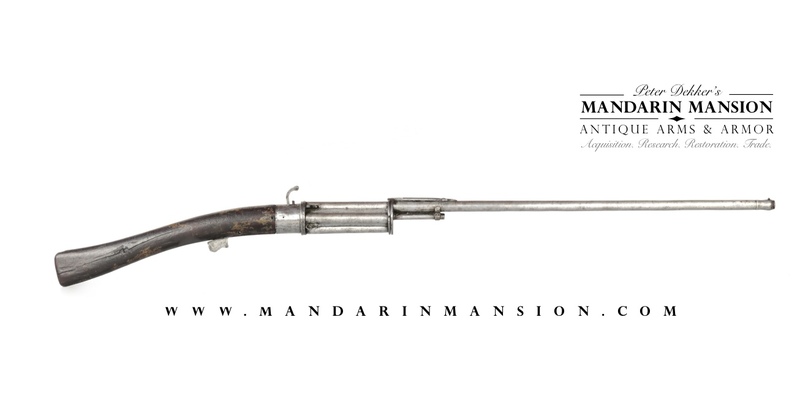 The Author had been aware since the year 1835, of the existence of ancient examples of repeating fire-arms, but it has only been on the occasion of his present visit to Europe in 1851, that he has been able to devote any attention to their chronological history, as exhibited in the specimens existing in the museums and private collections, to which he has recently obtained access. These specimens it is necessary to describe briefly, in order to render apparent the simplicity of design, the superiority of workmanship, the uniformity of construction by means of machinery, and the thorough efficiency of the repeating arms now submitted to the Institution. 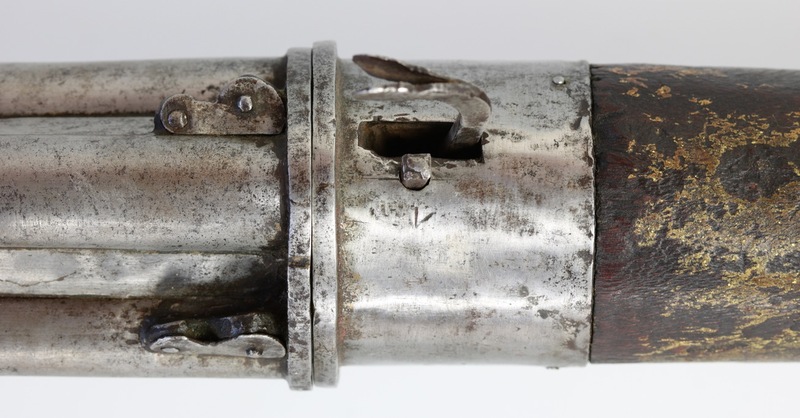 He further mentions having examined two specimens of matchlock guns with revolving breeches, very similar but with eight chambers the Musée d'Artillerie, Paris, and another in the possession of Messrs. Forsyth and Co., who obtained it from the late Lord William Bentinck, the Governor-General of India. This examples has five chambers. 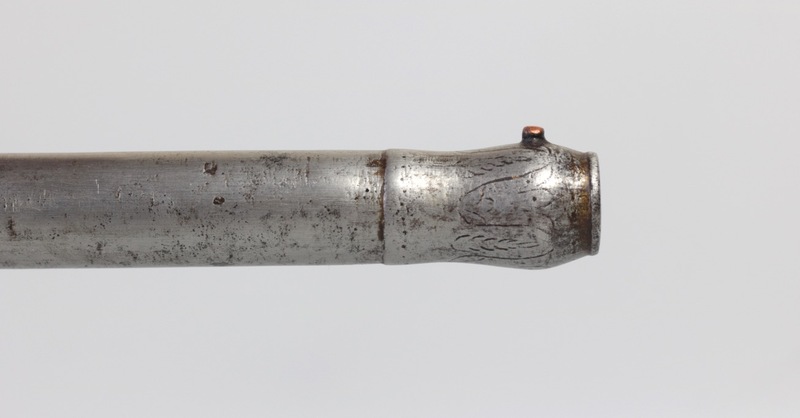 A very similar example was dated 1689 and published in Blackmore's Guns and rifles of the world , fig 555. Another, very nice example, with mostly intact paint, was recently sold by Runjeet Singh, which he dated to the 17th century. 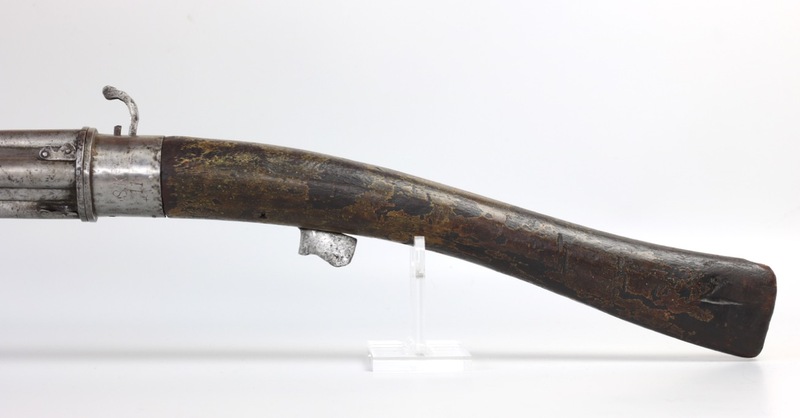 See his Winter catalog 2016, #25..
Colt seems to date the specimen he saw in the Royal Armories to the 15th century because its charge was ignited by a matchlock. 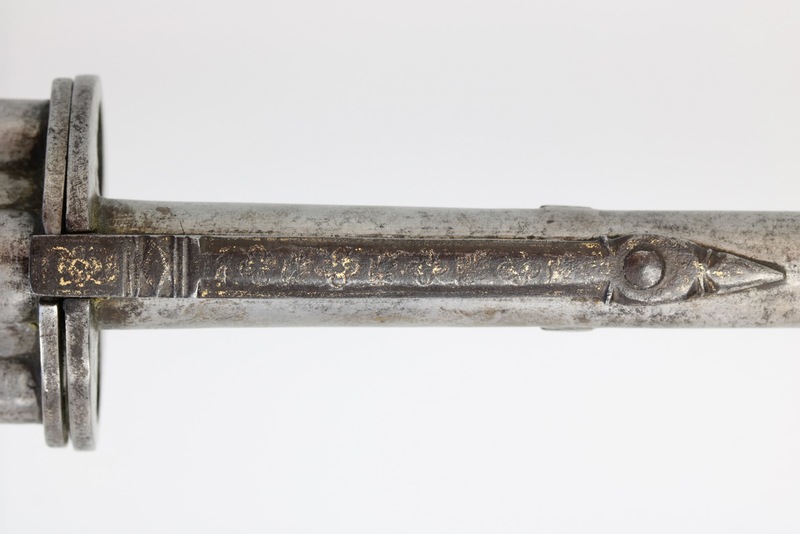 He may not have been aware of the fact that in Asia, matchlocks were produced well into the 19th century. The example he saw is still in the Royal Armories, under succession number XXVIF.2 and now more realistically dated to the early 19th century. Various others made it to western collections from India from the late 18th century onwards. All considering, our example probably dates from the 17th or 18th centuries. Our example is marked SK-11. It is interesting to note that the example sold by Runjeet Singh was marked SK-12. They may have been side-by-side in the same armory at some point. The paint on Runjeet's example suggests a northern origin. 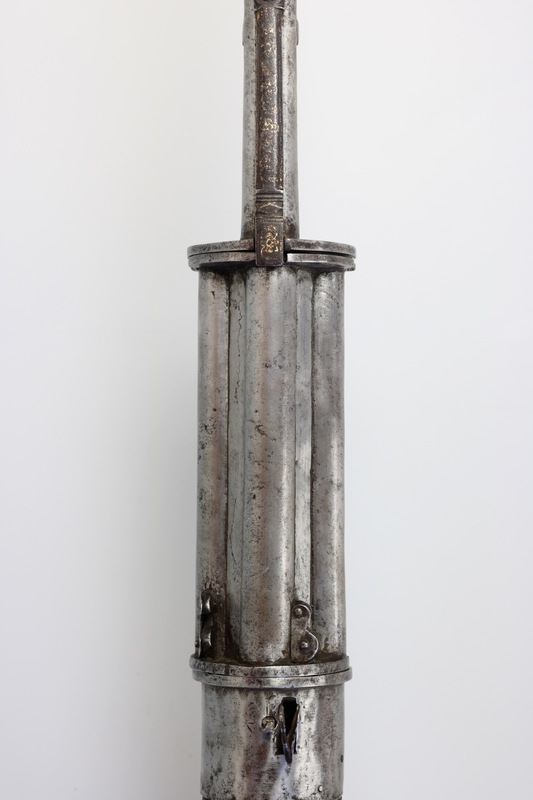 The SK mark was used by the Suffolk Regiment that served in India in the Fourth Anglo–Mysore War (1798–1799) against the Tipu Sultan including the Siege of Seringapatam where the Tipu Sultan was killed in action. 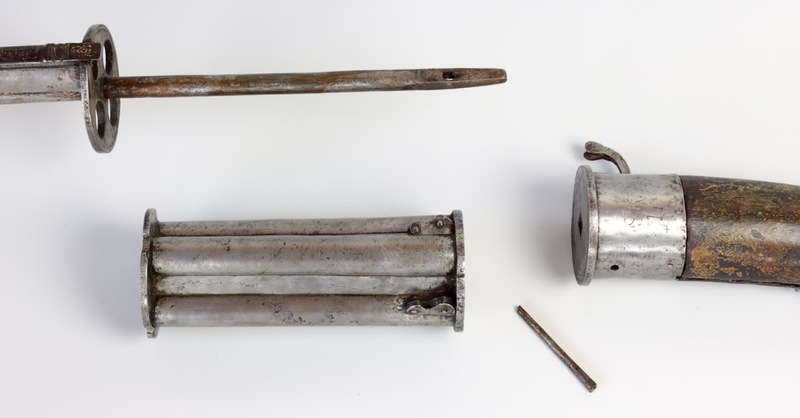 It is unclear whether the marks on these two matchlock muskets with revolving cylinders were really of this unit, or whether it's just a coincidence. It is noteworthy though that the markings use a Western alphabet. More research is needed. Another possibility is that SK stands for Sileh Khana, the name of the Jodhpur armory in Mehrangarh Fort. In decent, used condition with plenty of signs of age but still in working condition. Most of the lacquer on the wooden stock was lost. One priming pan cover is missing, the others are present and functioning. 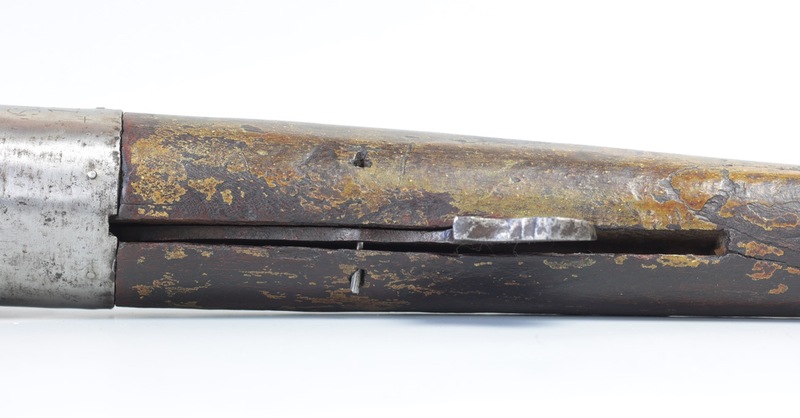 A working example of a rare multi-shot matchlock musket with revolving chamber. 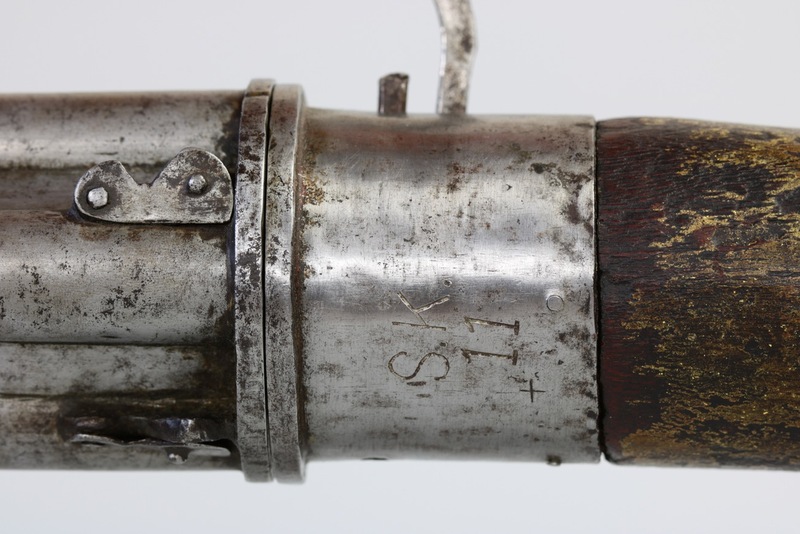 These guns enjoyed interest by none other than Samuel Colt himself. 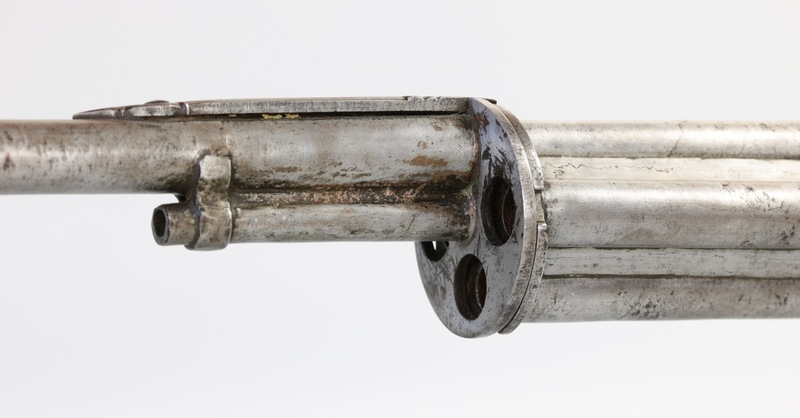 They represent an important step in the evolution of firearms with a revolving breech that is still in use on modern revolvers. 1. Blackmore, H.L., Guns and rifles of the world , Chancellor Press, London, 1965. Fig 555 shows an example dated 1689. 2. Roe, Joseph Wickham: English and American Tool Builders , Yale University Press, 1916. Page 167. 3. Col, Col. Samuel, On the application of machinery to the manufacture of rotating chambered-breech fire-arms, and their peculiarities. Excerpt Minutes of Proceedings of the Institution of Civil Engineers, Vol. XI. Printed by William Clowes and Sons, London, 1855. Page 4.